I like my chilli like I like my war, nuclear. …Wait, that didn’t come out right. 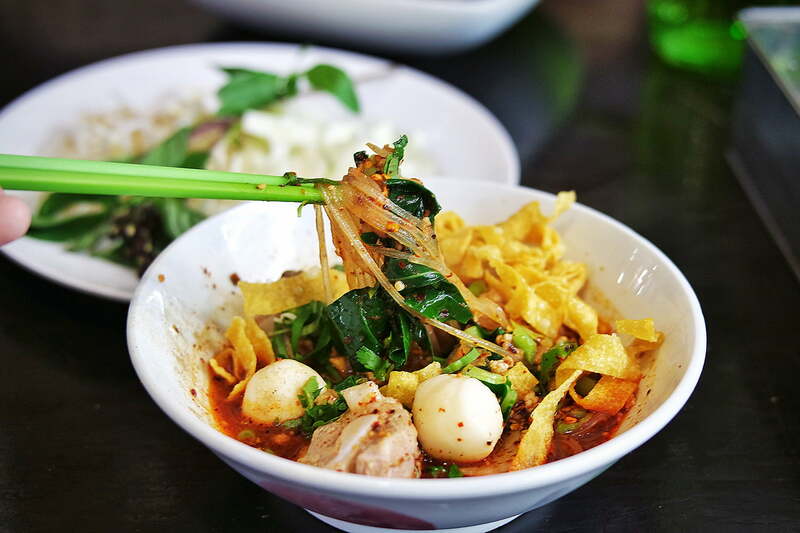 But I do like my chilli hot, and Do Dee Paidang in Haymarket has certainly thrown down the gauntlet, serving up a bowl of spicy noodles that have beaten many a food. Their Supernova Noodles are labelled as Level 7, for the 7 spoonfuls of chilli that they put in it. When you place the order, the waitress doesn’t just give you the dubious look that she saves for drunk men trying to pick her up. No, she first assumes that you mean something less spicy, and she points to the Level 3 and Level 5 options on a menu so filled with pictures it looks like a child’s storybook. I firmly stand my ground, and point to the Level 7, and her eyes widen slightly as she’s processing what I just said, and then followed by a look of uncertainty. “Are you sure?” She asks, “There are 7 spoons of chilli in that one. It’s very spicy”. I reassure her that it’s okay, and she shrugs and takes the order, recommending rice noodles as the noodle option. And the rice noodles arrive, shrouded in a fiery red soup, and topped with fish balls, pork ribs and crispy deep fried wonton skins. The first chopstickful looks very promising – the chilli flakes cling to each strand like an over-the-hill woman going through a mid-life crisis clings to a man. I bite into it, and well, I didn’t exactly get swift kick in the pants that I was expecting. I wanted my mouth to feel like it was on fire, and my eyes to start tearing…not this slow burn business. To be fair, it does build up slowly, but beyond causing a bit of a coughing fit, I don’t actually think it was all that spicy. In fact, I was more distracted by the slightly burnt aftertaste of chilli flakes that had been roasted too far, and that acrid bitterness was just something I couldn’t get rid of. Just a touch disappointing after all the chilli hype. The fish balls and pork ribs were tender and delightful, and the wonton skins did add a nice touch. Especially with the Som Tum Pu we ordered – a Thai Papaya salad with fermented crabs. This dish is not for the faint-hearted. By all western standards, this dish stinks like a fish rotting in a sewer, but for me, it was all sorts of salty deliciousness that I crave on hot days. Sour, tangy, salty, spicy, Som Tum consists of shredded green papaya, carrot, green beans, and fresh tomatoes, pounded in a mortar and pestle with lime, fish sauce, sugar and chilli. This particular version includes fermented crab the colour of a rotting corpse on NCIS, and I particularly enjoy sucking out the salty juices from the tiny pointy legs. What can I say? The stereotype is true that Asians will eat anything. And because the portions here are similar to what you get in Thailand, we order a dessert as well. Durian and Sticky Rice brings back comforting memories of family trips to Thailand, where my parents and I would share a small plate of this food hall staple while taking a break from all the sightseeing and shopping. Here, it’s served in a bowl, probably because the durian is pulpier in texture due to the difficulty of getting fresh durian in Sydney. It’s still every bit as comforting as I remembered, though. Warm, sticky glutinous rice is topped with creamy durian and coconut cream, lightly salted to bring out the sweet. At Do Dee Paidang, they finish with a small pinch of Foi Thong – golden strands of egg yolk made by drizzling a mixture of duck and hen yolks into a hot sugar syrup. So rich, so addictive. The food here really reminded me of food that I had in Bangkok, and I especially enjoyed the portion sizes. It may seem stingy, but really, the small order of noodles is only $5.50, and it allows us to try more things off the menu. I left feeling full and satisfied, but not wishing that there were napping options right in the middle of Chinatown for me to nurse my food coma. The service was well, what it was: not entirely attentive, but not rude either. It took awhile to get someone’s attention when it got busy, but once you got a hold of them, you never had to ask twice for what you wanted. Efficient. We really enjoyed ourselves at this little eatery on Ultimo road. Makes me wonder what the grilled menu items are like.